Who would pay so much money for just a hair cut? In what must be the priciest ever trim, Haji Hassanal Bolkiah, one of the world’s richest men and the Sultan of Brunei, is reported to have spent in excess of $24,000 on his most recent haircut. Prompted by his fear of catching swine flu, the Sultan of Brunei outlaid £11,000 (US$18,000) to fly his favorite barber, Ken Modestou, from London in an isolated private luxury cabin on board a Singapore Airlines flight. Modestou runs a barber shop at the Dorchester Hotel in central London and normally charges his clients just £30 for a haircut, but the billionaire sultan pays him thousands of dollars for every haircut, as well as paying for his flights and putting him up at a luxury hotel for a few nights. Surely there must be other better ways of spending that much of money instead of just a simple hair trim. The Sultan can either fly to London, or fly the barber from London. The question is: Who has a larger entourage ? The Sultan or the barber ? Sounds like the Sultan has a larger entourage. 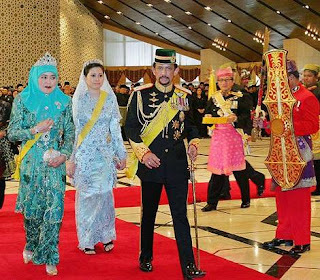 Hmm, what is the sultan is thinking when spend his money for this.